This video shows that the seemingly 'giant people' leaning out of the World Trade Center windows in fact have perfectly normal heights. The body height of these people is distorted relative to the windows heights because of the steep camera angle, and because the people are leaning towards the camera. Thus the conspiracy theories claiming that the 'giant people size' in the videos of the WTC attacks 'irrefutably prove' that these videos (if not the entire attacks) were fabricated using CGI, are debunked. Of course, one firstly has to wonder how this shot of our "Midget Man peeking out of a smashed WTC window" could possibly have been filmed from ground level. Secondly, should we just accept that the angle of this rare shot of a man standing in a WTC window (aired on TV in 1993) being practically identical to the angle of the "King Kong Man" shot (aired on TV in 2001) as a matter of "coincidental happenstance"? Thirdly, why are these images of Midget Man so incredibly "whitewashed" (i.e. abnormally "overexposed")? It's not like video cameras back in 1993 where ALL THAT crappy. 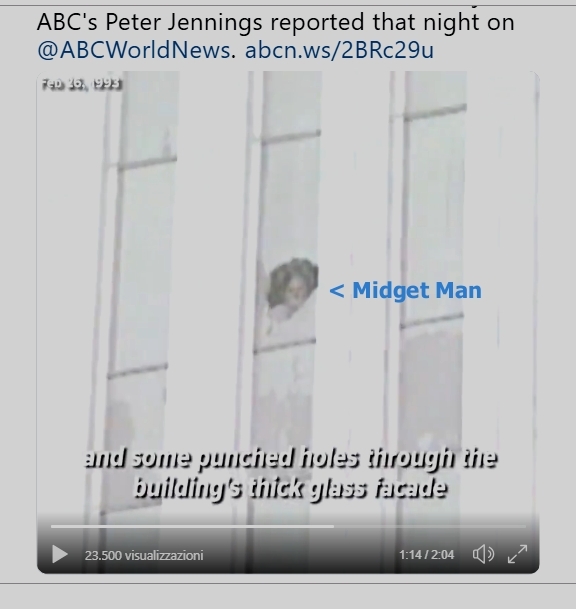 Please go watch that video - and replay the few seconds (from 1:14 onwards) which show this Midget Man standing in a WTC window - and then, watch closely when the "camera shot zooms out". It's hilarious. 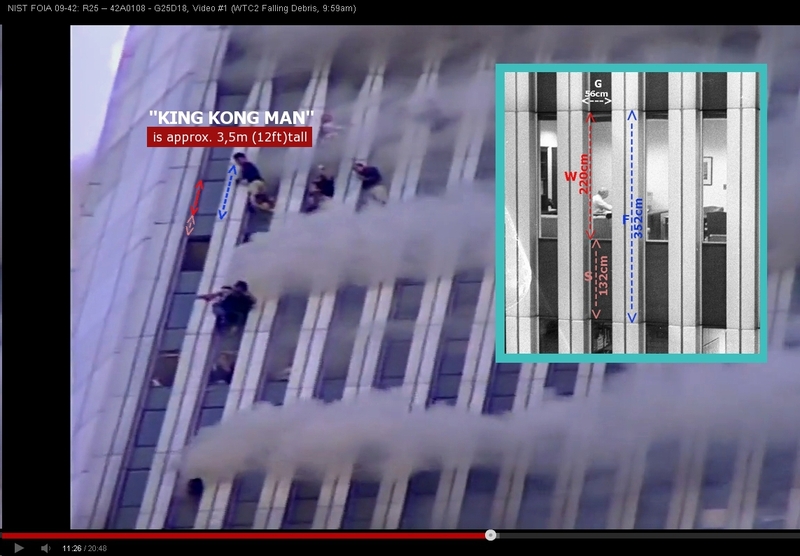 I'm afraid it's game over for all the aspiring debunkers of my "King Kong Man": we now have definitive proof that these images (purportedly depicting people standing in the WTC windows in 1993 AND 2001) were completely computer-generated and thus, do not represent reality. End of story. Definitive end of story, that is: ALL the imagery of 9/11 aired on TV was nothing but a prefabricated "Hollywood movie" - as comprehensively proven here at Cluesforum with more than ten years of additional research following my 2007 September Clues documentary.